“Hmmm... that’s yummy”, says Fiona, finding happiness in bitterness. 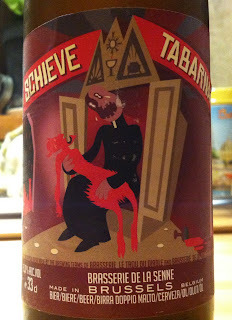 Schieve Tabarnak is a joint venture ale, a product of the breweries of Trou du Diable in Quebec and Brasserie de la Senne in Brussels. I hadn’t heard of it before our friend Benoît enthusiastically handed us a bottle a while back, singing its praises. The name is apparently some kind of take on the infamous "crooked architect" of Brussels, about whom we've written before. Joseph Poelaert designed the giant blot on the cityscape known as the Palace of Justice, destroying half of the Marolles district in the process and insuring that the word “architect” would be an insult in Brussels for years to come. Exactly how they get “Schieve Tabarnak” from “schieven architekt” eludes me. There’s something crooked there in any case. Thanks, Benoît, for finding this one for us!